Radon is a harmful gas that can have serious effects on your health. It occurs during the natural breakdown of uranium in water, rock, and soil, which releases the gas. It gets into the air you breathe and can be dangerous. At AdvantaClean, we want all our customers to be well informed, so we’ve answered some common questions you receive. If you need radon services, including testing, mitigation, and remediation, turn to our highly trained professionals. Is Radon Gas Really That Dangerous? Because radon gas does not have a scent, color, or taste, it can be difficult to detect. However, inhaling too much of it can do serious damage to your healthy. 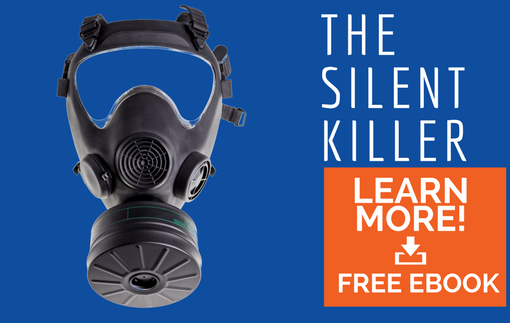 According the United States Environmental Protection Agency (EPA) and the Surgeon General’s Office, radon is a known carcinogen linked to lung cancer. It is the second leading cause of lung cancer, second only to smoking. Statistics show that an average of 20,000 people are killed every year because of radon poisoning. Radon gasses are released when the uranium in soil, water, and rock breaks down in the foundation. It moves up through the ground and into the air. It enters your home through cracks and holes in the basement floor or foundation. The simple answer is yes! Because radon has no color, smell, or taste, it can be very difficult to detect. Yet, the EPA estimates one out of every 15 houses in the United States has a high levels of radon gas. What Is Considered a High Radon Level? Radon is measured in picocuries per liter. Anything over 4.0 pCi/L is considered elevated levels of radon while anything 2.0 pCi/L and below is considered safe. Does Radon Poisoning Have Any Symptoms? Yes. While radon gasses can’t be seen, smelled, or tasted, their effects are easily known. An individual suffering from radon gas poisoning may suffer wheezing, chest pains, coughing blood, difficulty breathing, and other respiratory infections. Individuals suffering from radon water poisoning can experience cramps, stomach pain, digestive issues, stomach cancer, and more. How Can I Fix My Radon Problem? Radon issues can be dealt with either through mitigation or remediation. If you have lower levels of radon, you can take preventative measures by airing out your home and keeping it ventilated. With higher levels of radon, it is important you contact our professionals at AdvantaClean. We use advanced methods and cutting-edge technology to locate the source of the gas and remove it. Through our radon remediation services, you can breathe easier knowing your home is safe. Homeowners can purchase radon testing kits to conduct at home. Depending on if you use an electronic machine or a canister, it can take anywhere from 48 hours to 72 hours to do the test. It is important that before doing the test, the house is fully sealed for 12 hours. Our professionals have the tools and knowledge to perform and provide accurate results. If you have radon in your home, it is important you contact the professionals at AdvantaClean. Call (877) 800-2382 today to schedule a service.